Keep freight moving, reach drivers and teams and mitigate risks with one simple solution. Regroup’s intuitive and easy-to-use platform delivers reliable notifications and two-way communications, wherever you are. Notify drivers of available loads, alert stakeholders of delays or automatically alert entire teams of severe weather in a specific location with geo-targeted notifications. Having a solid communication plan can help logistics companies improve profitability and mitigate risks during critical events. Regroup’s award-winning platform enables you to increase operational efficiency and maintain business continuity when traditional communications are down or saturated. And, with exclusive features like Regroup’s QuickConference, it’s easy to connect with your entire team, no matter where they are, with a single tap. Using Regroup to complement your operations can help your company better manage lanes, staff, drivers, shipments and more. Regroup is the smart business solution for logistics companies on the move. Its ease of use and robust features make it a perfect complement to your communication strategy while allowing you to maximize operational efficiency and mitigate risks. 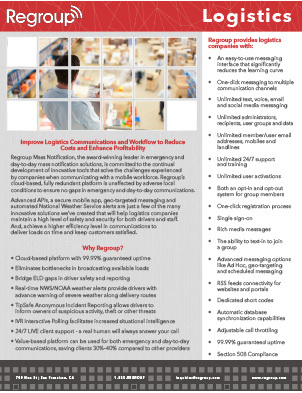 Regroup for Logistics – our fact sheet shows why a mass notification system is an essential tool for logistics professionals, shippers and more.